My first death in Sunless Skies was equal parts embarrassing and fitting. My crew was desperate, starved and half-mad from the horrors they’d witnessed. We’d just narrowly escaped what we initially thought to be a friendly vessel, until a bouquet of otherworldly tentacles burst from its bow. There were no ports in sight. It wouldn’t be long before my ragtag gang turned to cannibalism—or worse. Then I accidentally plowed my ship into a piece of debris, my ship ruptured, and everyone froze in the pseudo-vacuum of space. A merciful end, all things considered. Sunless Skies—which leaves early access today—is, in many ways, similar to its predecessor, fantastic story-driven rogue-ish-like Sunless Sea. It takes a great foundation and turns it into a game that, after ten hours with a near-final version, I think I might love even more than the first. You once again pilot an itsy-bitsy vessel through the clockwork guts of a vast and sinister frontier, except this time, instead of sailing the underground waters of the “Underzee,” you live (and die) among the stars. When you die, you pass some of your traits, wealth, and sometimes-unreliable map knowledge onto your next captain. Then you hope for the best—or at least a less horrifying end (I did this by creating a lineage of women who wore the same grotesque tentacle hat, all named Madam Squidhat I, II, III, etc). Sunless Skies’ setting is arguably even more fascinating than Sunless Sea’s, set against the backdrop of a Victorian Empire that’s ascended to the stars, built an artificial clockwork sun, and filled a power vacuum left behind by living stars, now dying under mysterious circumstances. The Queen controls time, and workers toil to mine a physical embodiment of the stuff for her and her kingdom. Some workers dream of a retirement in which they’re bequeathed just a little more time to savor their golden years. Others dream of killing the Queen. You can ally with the loyalist “Stovepipes” or the rebellious “Tacketies.” Or neither. There are, it turns out, much more threatening things among the stars than political machinations. Oh, and you pilot a SPACE TRAIN instead of a ship. Along the way, you interact with characters and locations through quick, brilliantly written interactive-fiction-like vignettes. Story suffuses everything, even leveling up your character, which is done by selecting bits of their backstory. You can pursue a number of goals, from accumulating an unassailable fortune to penning the next great (very) British novel based on all the strangeness you’ve seen and heard about from others, as well as all the voices whispering in your head. But first you’ll have to survive, and that part is easier said than done. The skies teem with dangers to both the body and mind. Marauder ships and unspeakable creatures damage your hull, while harrowing sights and experiences slowly fill your sanity-dictating “terror” meter, giving you nightmares and making your crew unruly. Combat is faster and more enjoyable than in Sunless Sea, with strafing mechanics and manual aim balanced with an overheating mechanic that keeps you from getting too trigger-happy. 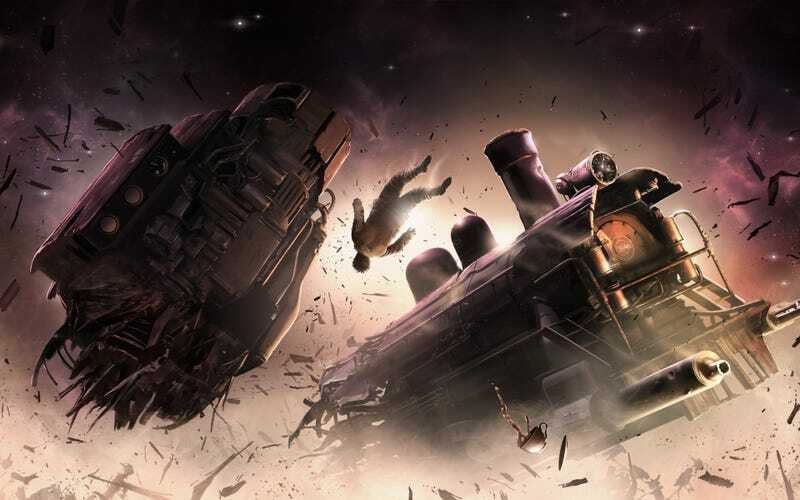 But it’s everything that happens around combat that makes Sunless Skies so fascinating—the personal narratives that feed into your successes and especially your failures, whether they stem from overzealousness, cowardice, or the greatest killer of all: curiosity. Fortunately, survival is a more straightforward process than in Sunless Sea, which didn’t exactly illuminate a path to sustainability through its sickly green caverns. You still have to ensure that you’re picking up a steady supply of fuel and supplies from ports (or the husks of dead ships), but in Sunless Skies, you can pursue “prospects,” which are missions that see you ferry goods between ports to turn substantial profits. This mechanic does double duty: it earns you money for fuel, supplies, and ship upgrades, and it gives you a rough idea of where to find safe haven between long journeys across the game’s treacherous heavens. This doesn’t make Sunless Skies easy by any means. When I say “rough idea,” I mean rough. You’ve still got to explore to fill in your map, and that inevitably means a lot of wrong turns. But it does mean that when you die—and you will—it feels more like it was at least partially your fault. More importantly, though, it makes the choice between pursuing sustainability and exploration (the game’s true joy), well, a choice than it sometimes was in Sunless Sea. Death largely stems from disasters that occur when you plunge headlong into the grasping unknown, and, with four large regions to explore, you’ll be doing a lot of plunging. Each new discovery is tinged with dread; will you find an interesting new story or character, or some cosmic horror that infiltrates your nightmares, leading to a bitter end beyond your comprehension? Will you look back on that moment later and realize it was then and there that you doomed your crew of incognito princesses, repentant devils, and purple alcoholic monster men, each with their own upgrades and stories? It hurts to kill your crew, especially since most characters in Sunless Skies just want to live their lives. For some, that means playing a cricket match that’s literally endless (whether that’s due to time-altering shenanigans or extreme Britishness, it’s hard to say). For others, it’s writing a fun book about people eating each other, or visiting a “hospital for the spirit” where staff become whoever people want to see so they can relive arguing with a dead relative over their will for the hundredth time. That might all sound strange, but it’s really just people taking advantage of the game world’s extraordinary circumstances to satisfy painfully ordinary desires and urges. The skies may drone on with a skull-rattling strangeness, but people will never stop being people. Well, unless the madness takes them.